Making the soup is super easy. You simply sauté onions and carrots in the liner of your electric pressure cooker, in some olive oil, until they are turning soft. Then you add the tomatoes, dried basil, and the chicken stock and go! Because the pot is already warmed up from cooking, it takes less time to come to pressure and then it is only a 5 minute pressure cooking time. After the NPR time, open carefully and add the cream or half-n-half. You could certainly use coconut milk, and vegetable broth if you wanted to make this recipe vegan friendly. Heat the Instant Pot on sauté, normal. Add the oil when the IP is hot, and let it sit until shimmering. Serve with toast, grilled cheese sandwiches or some kind of bruschetta. Add the vegetable and sauté for 8-10 minutes, until onions and carrots are soft and browning. Add the tomatoes, basil and chicken stock. Lock on the lid, and set to manual/pressure cook for 5 minutes. Blend with an immersion blender, right in the pot. Season with salt and pepper - check for your personal taste and add more if needed. Season with salt and pepper - check for your personal taste and add more if needed. Serve with fresh basil as a garnish. Serve with toast, grilled cheese sandwiches or some kind of bruschetta. 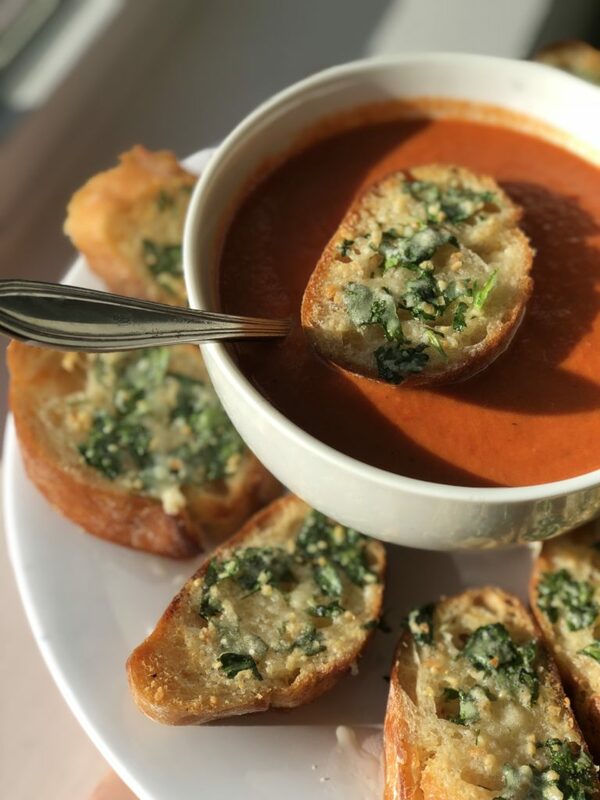 Is there anything more comforting on a cold winter day than a bowl of steaming tomato soup, served with either a grilled cheese sandwich, or some other morsel of bread? I think not! Sometime during each week, we here in the Quick and Carry Kitchen start talking about what we want to make for the upcoming Facebook Live show. We pay pretty close attention to what is going on in the Instant Pot world and read tons of posts each week, scanning for fun recipes and ideas for our shows. 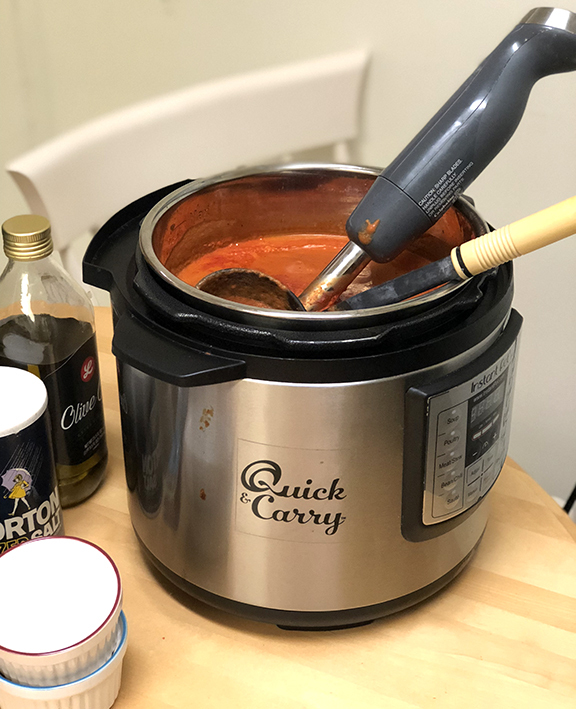 Someone on one of the big Facebook groups must have posted this recipe because it sure caught my eye and I could not stop thinking about it…and, it would be easy to do at work, which is why we started the #takeyourInstantPottowork movement. This recipe comes from Jill over at ThisOldGal.com. Jill is such a great recipe writer and truly one of the queens of the IP community and every single recipe of hers that I have tried has been excellent. This one is no exception. Plus, it has memories…when my first child, a daughter, was a tiny girl, and we were visiting her dad’s parents, Gramma BB took us to Nordstroms to shop, and then lunch. We had this lovely soup…and I remember it thirty years later! Use an immersion blender to blend the soup right in the pot, or, carefully blend a batch at a time in a regular blender. It is delicious right out of the pot, but, I thought it was even better then next day. 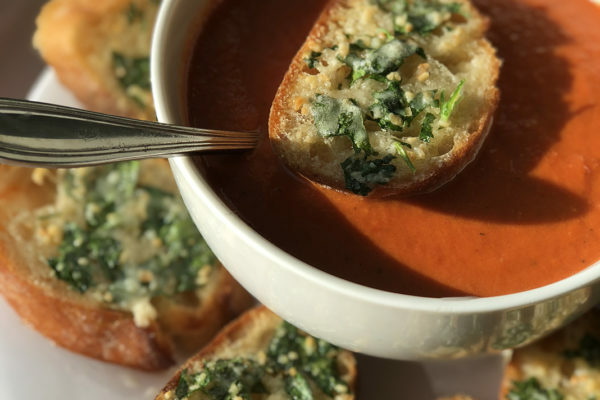 This recipe make a LOT of tomato soup, so you probably will have the tasty leftovers. Make some grilled cheese sandwiches or some bruschetta to go with your soup. Jill has a fine recipe for a parsley butter that is delicious on some French bread. This is perfect for a winter lunch or even a light dinner, and would be a great potluck soup, simply because it is so easy and would serve so many! Here is our Facebook Live Quick and Carry Kitchen Show, featuring this delicious recipe. Next articlePancake in the Instant Pot – Really?